VietPress USA (Nov. 2nd, 2018): Today on Friday, Nov. 2nd, 2018, former President Barack Obama stirred up the Miami campaign in Florida to support Democrats Bill Nelson for Senate and Andrew Gillum for Florida's Governor. Andrew Gillum, the Democrat party’s gubernatorial candidate, introduced Former President Barack Obama as "Our forever President" and the crowded people chanted "Obama forever.. Obama forever!". "Our forever President" started his speech blasted the president and the Republicans supporting him as attempting “to scare folks with whatever boogey man or divisive social issues they can come up with” in their campaigns. Obama criticized Trump administration is trying to overturn the Affordable Care Act (ACA), his biggest legislative accomplishment. President Obama called out Trump and the GOP over recent promises to protect health coverage for preexisting conditions, but it's now “The health care for millions is on the ballot,” Obama said. Turning his fire on Republican Ron DeSantis, who faces Gillum in the Florida governor’s race, and Gov. Rick Scott who is attempting to replace Nelson in the Senate, Obama decried what he said was GOP hypocrisy on health care. Former President Barack Obama hit the campaign trail in Miami Friday in support of Democrats Bill Nelson and Andrew Gillum and delivered a speech aimed squarely at Donald Trump without ever mentioning his name. 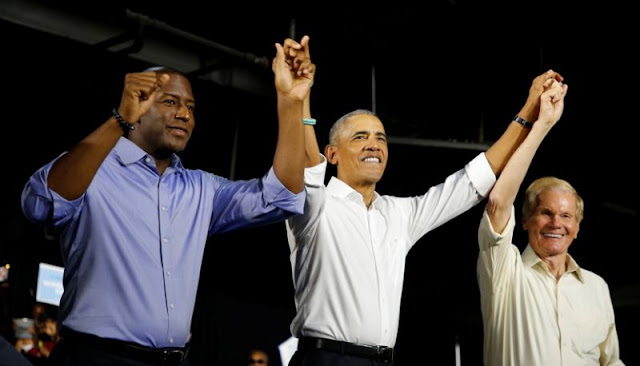 Introduced by Gillum, the party’s gubernatorial candidate, as “our forever president,” Obama blasted the president and the Republicans supporting him as attempting “to scare folks with whatever boogey man or divisive social issues they can come up with” in the campaign. At the start of his speech, Obama was interrupted repeatedly by roughly a half-dozen hecklers. Much of Obama’s remarks were focused on health care and what he views as Republican efforts to overturn the Affordable Care Act, his biggest legislative accomplishment. “The health care for millions is on the ballot,” Obama said, before calling out Trump and the GOP over recent promises to protect health coverage for preexisting conditions, one of Obamacare’s signature provisions. “That law made it illegal for the first time for insurers to discriminate against folks who had a preexisting condition,” Obama said. Turning his fire on Republican Ron DeSantis, who faces Gillum in the governor’s race, and Gov. Rick Scott who is attempting to replace Nelson in the Senate, Obama decried what he said was GOP hypocrisy on health care. At rallies in Florida and Missouri this week, Trump has sought to position himself and his party as guardians of protections for coverage of preexisting conditions, belying their efforts to weaken Obamacare to the point of failure. Obama reminded his crowd that Republicans had come up one vote short of repealing the ACA altogether, and again warned about the stakes of the midterms. “If they get control of Congress, you’d better believe they’re coming after your health care,” Obama said, as his voice began to falter toward the end of his 45-minute speech. Obama called on Republicans who could see through the president’s political rhetoric to vote for Nelson and Gillum. “I’m assuming they understand that a president doesn’t get to decide who is an American citizen and who’s not,” Obama said in reference to Trump’s plan to overturn birthright citizenship. At his own rally in Huntington, W.Va., Friday afternoon, Trump said he watched Obama’s speech in Florida. The president made no mention of coverage for people with preexisting conditions. Despite the interruptions of hecklers, Obama’s message resounded with the thousands who had come to see him.